Analytics can be a challenge for many eCommerce businesses. In addition to the technical complexity of setting up analytics, the data generated can be confusing and overwhelming to understand. The good news is that data visualization technologies have come a long way over the past several years, and it’s easier than ever to turn raw data into valuable insights. Even Google entered the space with Google Data Studio in 2016. 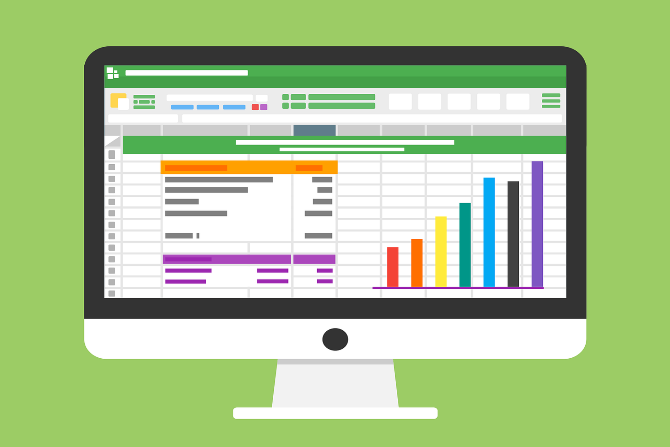 In this article, we will look at how Google Data Studio can help you make sense of eCommerce analytics and ultimately improve your revenue and profitability. Google Data Studio is a product that enables you to turn raw analytics data into informative dashboards that are easy to read and customize. If you’ve ever manually built a dashboard, you will appreciate the platform’s pre-built data connectors that automatically handle formatting issues and invalid values without forcing you to write a single SQL query. You simply select the data you want to include and manipulate the data in a visual environment. Data Studio also provides real-time connections between various Google and third-party products through connectors. For example, you can connect Google AdWords, BigQuery, Google Analytics, Google Sheets, and YouTube. 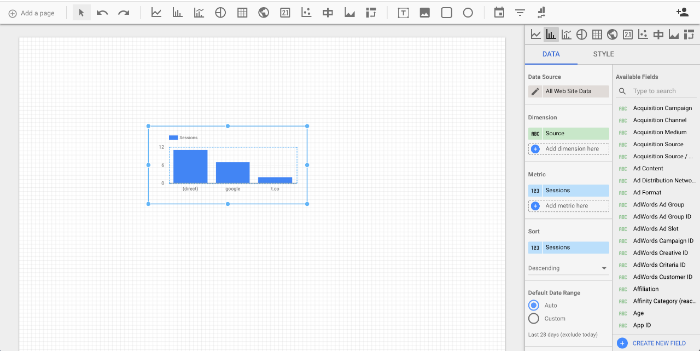 You don’t have to worry about downloading CSV files, importing them into a dashboard, and keeping everything up-to-date—it’s all done for you with Google Data Studio. And best of all, it’s free! 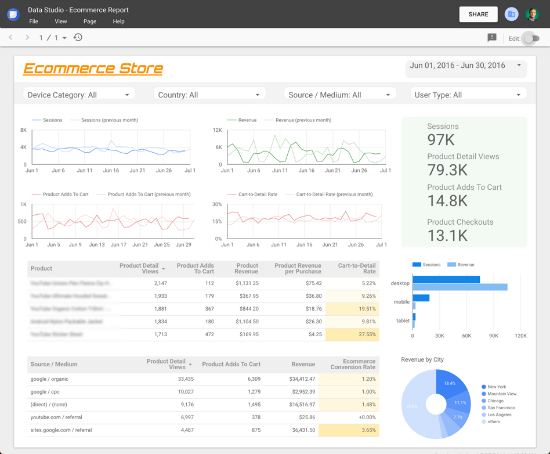 For eCommerce businesses, Google Data Studio can help with both search engine optimization (SEO) and eCommerce metrics. The platform connects with Google Analytics to show you traffic metrics and Enhanced Ecommerce metrics. This enables you to track everything from the best referrers to average order values in a single place. These are powerful data points that can make a real difference in maximizing revenue. When did most customers abandon their carts? What product pages have a lower than average conversion rate? What marketing channels have performed the best? The answers to these questions can help you understand where small changes and investments can produce outsized returns in the form of improved conversion rates. For example, you might see that most customers abandon their cart after they’re prompted to create an account to checkout. This may lead you to explore offering a guest checkout option that might dramatically increase your conversion rate and, by extension, accelerate your revenue growth. There are many different data sources that you might want to include in Google Data Studio, but Google Analytics is the most common request. Click on Data Sources and then the + button in the lower right-hand corner. Search for Google Analytics on the following screen. Click the Authorize button to connect the account. Select the account that you would like to connect. Click the Connect button on the top right-hand corner of the screen. The following screen shows a list of the possible data points that import into a dashboard. If you don’t see the data point that you want, you can click the + Add a Field button to create a new calculated data point that combines any of the existing imported data. If you have enabled Enhanced Ecommerce in Google Analytics, you should also see the ecommerce-related fields in the list of data fields available to choose from. Once you have selected the data fields that you want, click the Create Report button to begin the process of building a dashboard/report. These reports are highly customizable with charts, tables, calendars, and other tools to display the data in a way that’s easily digestible, as well as text labels, images, and shapes to organize those data elements. This way, you can see only the metrics that truly matter and present them in a way that’s appropriate for internal or external use. Google AdWords or DCM – See how paid advertising campaigns are performing. YouTube Analytics – See how product videos are performing. Amazon Seller – See how Amazon sales are performing. MailChimp or Constant Contact – See how email marketing campaigns are performing. You can include data from all of these different sources in your final reports to provide additional insights. For example, you can compare the conversion rates from email marketing, paid advertising, and SEO efforts to see what is generating the best return on investment. The process of creating a Google Data Studio dashboard is relatively straightforward, but selecting the appropriate metrics and layout is a much more challenging task. While some of these choices may depend on your specific business model, there are some broad metrics and layouts that apply to all eCommerce businesses. These data points can tell you a lot about your visitors’ shopping behavior. For example, checkout funnel metrics might include the cart-to-detail rate (number of products added to cart per number of product detail views) and the buy-to-detail rate (number of products purchased per number of product detail views). You can study high-performing products to see what might be helping and apply the techniques to underperforming products to improve them. The next step is selecting the appropriate layout for these metrics. For example, the current conversion rate is good to know, but showing a trend over time can be more helpful. You may also want to know what customers or referrers are the most valuable in order to focus your efforts on those channels rather than broadly targeting audiences. In other words, you need to make sure that the data is presented in a way that produces meaningful insights. If the dashboard is being shared with external team members, it often makes sense to style it properly and provide descriptions of each data point. A failure to provide good documentation can make the entire report a lot less valuable – even if the insights are obvious to you and the internal team that created the report. Our Google Data Studio template does all of this heavy lifting for you by selecting the appropriate metrics and creating an easy-to-use layout. While Data Studio is a great way to visualize this data, Avatria Convert takes this data and makes it actionable for you, so you don’t have to spend a lot of time analyzing the data and determining how to apply the insights gained from using the dashboard. Google Data Studio helps make raw analytics data a lot easier to understand for business decision makers. With Google Analytics and Enhanced Ecommerce data alone, you can gain a lot of insight into what products are over- or underperforming, as well as what referral mediums or marketing channels are worth doubling down on. At Avatria, we are focused on leveraging data and analytics to improve eCommerce revenue and profitability. Avatria Convert leverages machine learning techniques to turn Google Analytics customer behavior and shopping data into optimal product ordering to boost conversion rates. If you’re interested in learning more, try a free trial today! Download our free Google Data Studio template to immediately start tracking ecommerce metrics that matter.